** Brian Hibbs is one of the most transparent retailers when it comes to the business of comics so this week's announcement of his new Graphic Novel Club being used to stimulate his business with the impending minimum wage hikes coming to San Francisco is an interesting move. The Beat was one of the first places where I saw the news and in the comments, Hibbs explains this move a bit more. Just for clarity’s sake (I don’t want to get into a lot of back-and-forth on this) we in fact pay all of our employees over current minimum wage, but if we don’t keep parity with the MW increase (ie: $3.95/hour in extra costs over the next 3 years, then CPI raises after that), then we’re effectively giving staff a wage cut which I find entirely unacceptable. Dustin Harbin also pops up in the comments to offer some speculation about the cost of living and feasibility of maintaining a small business in San Francisco. So for a minimum of $240 a year (a monthly subscription costs $20 a month,) you'll get a curated comic experience courtesy of the folks at Comix Experience. That's an interesting concept and Hibbs needs over 300 people to take advantage of this to cover the cost-of-living increases for his employees. While he declined an interview with Tom Spurgeon's The Comics Reporter, The Beat did a followup interview with Hibbs explaining a bit of the logistics that he faces with the rising minimum wages. The thing is, as MW rises, so do we need to raise our pay — I’ve spent twenty-six years being a not-MW job (well, twenty-five, because I worked seven days a week in year one), and I don’t want to begin now. When MW is raised by $1.20/hour in May, I believe that means that the people I pay $11.25 today will need to make no less than $12.45 at that point, because, otherwise, are we not effectively CUTTING their pay? In the same way, I have to pay my managers more so that there’s, y’know, a financial benefit for being a manager, and they’re not making the same as “just” staff — and I can’t raise it less than the amount MW is raising by, otherwise, again, they’re effectively getting a cut. This will be an interesting one to follow. If nothing else, Hibbs is a much savvier businessman than I think he gets credit for (and he already gets a lot of credit for his business acumen.) Watching comic shops operate is fascinating as they're actually the customer for Diamond (and therefore most comic book publishers.) Hibbs is a middleman but he's also a gatekeeper for his customers and the comics they get. ** This week, Mike Mignola spoke with Elvis Mitchell on KCRW's The Treatment podcast. Mitchell is a good and knowledgeable interviewer and Mignola is deprecating to a fault so this is a fairly entertaining and short interview. 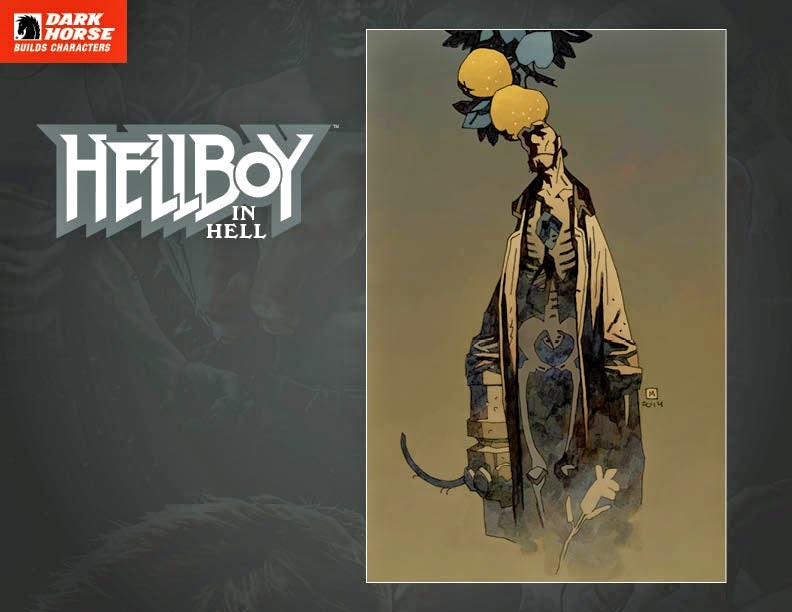 Last week, CBR also ran an interview with Mignola that I'm calling out just so I can include the saddest picture of Hellboy here. ** Speaking of Spurgeon, Tom reflects back on the closing of a Seattle comic shop and ruminates a bit what it means in a grander scheme. I think it's possible we might lose more than a few comic book stores of note over the next few years. A lot of the best shops are being run by people near retirement age, and another group is run by people who about to hit that mid-forties age where doing something else in grown-up fashion as a job seems like a dwindling opportunity. It's a tough thing we ask them to do just in general, without the stunts and moves that would have to be potentially discombulating and where they're treated like we're doing them a favor. We also have strong anecdotal evidence that every comic book shop that closes is a last straw for dozens of fans who take that opportunity to wrap up their own engagement with the medium. Every good one's passing, no matter how generous our standard for good, seems worth noting. ** I can only image what treasures there must be in Craig Yoe's art collection, which I guess you can now see if you're in the New York area. Rob. M. enjoyed the flavor of the zine Flavor. The Quick Hits posse rounds up reviews on Politically Inqueerect, Birthright Volume 1 and A Pretty Bunch of Things I Did Not Buy. Rob M. tosses and turns with Sleepless Knight. Rob M. looks at Rat Queens #10. Rob. M. highlights the NEA's profile of our own Whit Taylor! James K. opens the doors of perception with Ales Kot and Langdon Foss' Surface #1 & 2. Rob M. looks at Dynamites new Story Bundle offer.